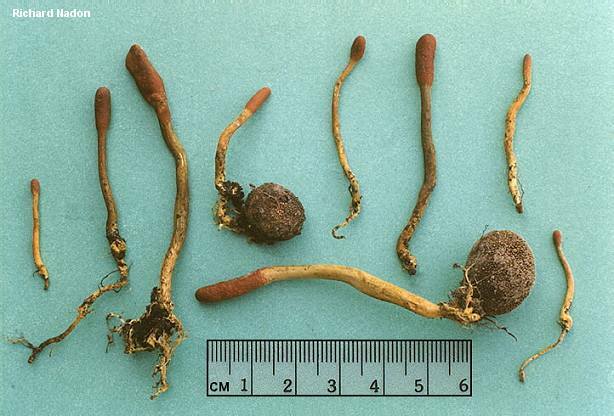 Species of Cordyceps are my mushroom hunting nemeses. 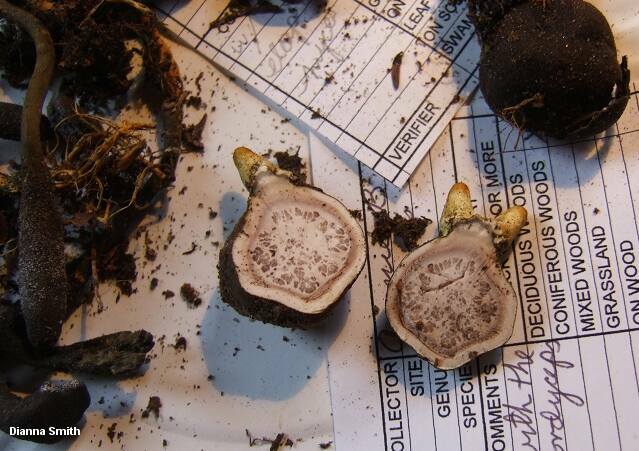 As far as I am concerned, they are about as cool as mushrooms can get; some of them parasitize underground puffballs, while the rest attack insects. 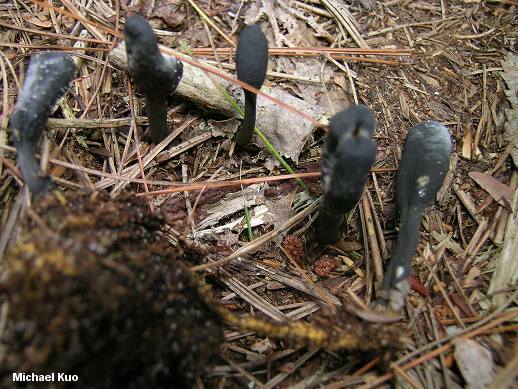 But the challenge for a mushroom hunter is to recognize Cordyceps in the woods and manage to dig up, collect and/or photograph the parasitized puffball or bug. 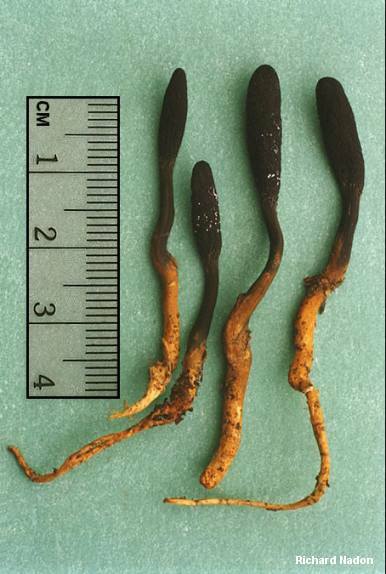 The salient features of Cordyceps ophioglossoides (print this up and take it to the woods with you if you want to avoid my mistakes) are: the tough, club-shaped fruiting bodies that lack a clearly defined cap; the reddish brown to black top area and the yellow to brownish or black lower area; the presence of yellow cords connecting the parasite and the puffball; and, of course, the presence underground of the parasitized puffball (which belongs to the genus Elaphomyces). 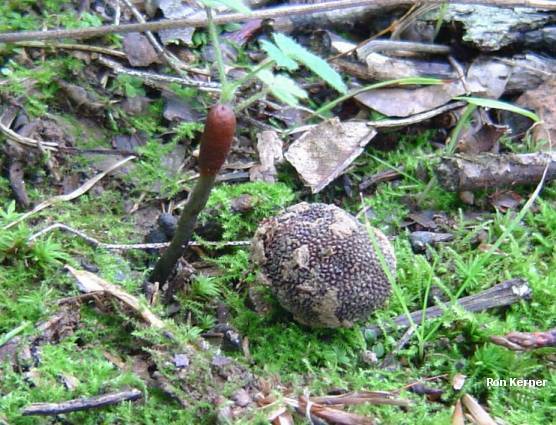 Ecology: Parasitic on underground puffballs (sometimes called "false truffles") in the genus Elaphomyces; late summer and fall; widely distributed in eastern North America. 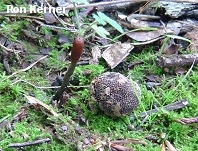 Fruiting Body: 2-8 cm long; up to 1 cm wide; club-shaped, with the top wider than the base; without a clearly defined "cap," but the upper portion reddish brown and smooth when young, becoming blackish and roughened or pimply (use a hand lens) with maturity; lower portion smooth throughout development, yellow to brownish or blackish, rooting; base attached to yellow cords that lead to the Elaphomyces fruiting body; flesh whitish and tough. Microscopic Features: Spores segmented and threadlike; breaking into elliptical segments 2-5 x 1.5-2 µ.
REFERENCES: (Ehrhart, 1784) Link, 1833. (Mains, 1957; Smith, Smith & Weber, 1981; Breitenbach & Kränzlin, 1984; Phillips, 1991/2005; Lincoff, 1992; Horn, Kay & Abel, 1993; Barron, 1999; Roody, 2003; McNeil, 2006.) Herb. Kuo 09150704.